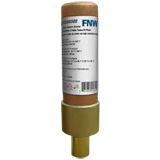 The FNW water hammer arrestors are engineered devices that provide maintenance-free continuous protection systems against water hammer. Water hammer is a hydraulic shockwave generated within a water distribution system due to a sudden stop in water flow. If allowed to exist for any length of time, water hammer can cause pipes to rattle, is capable of bursting pipe, and damaging other components within the system. When installed properly, there is an unobstructed shock path to the arrestor that is absorbed by a piston driven and isolated cushion of air. * Always check local plumbing codes to determine if access panels are required.